Two scientists have produced an illustrated key to define the subtle differences between the 41 species of snout moth grass borers that currently dwell in the Western Hemisphere. 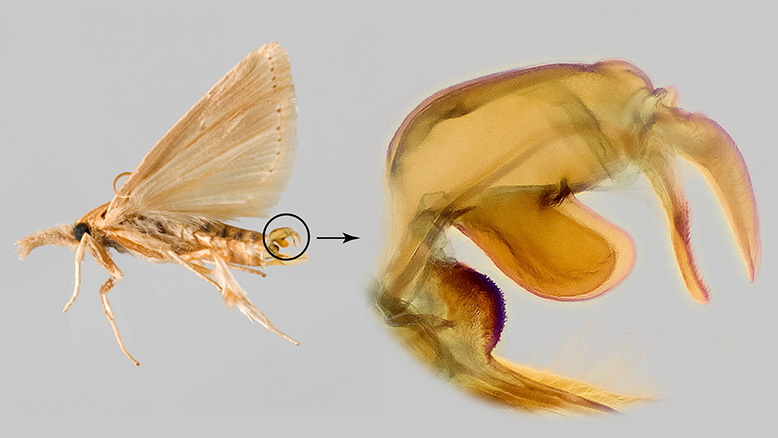 The researchers conclude that the adults moths are too tough to tell apart by external characters, and therefore, the only way to identify the species is by dissecting and comparing genitalia. The study is published in the open-access journal ZooKeys. This identification key is compiled by Dr. M. Alma Solis and Dr. Mark Metz. Both scientists are Research Entomologists at the Agriculture Research Service’s Systematic Entomology Laboratory, USDA. Dr. Solis is Curator of the U.S. National Pyraloidea Collection located at the National Museum of Natural History, Smithsonian Institution Washington, D.C. The caterpillars of this group of snout moth grass borers feed on crops such as sugarcane, corn, rice, sorghum, and on native grasses throughout the Western Hemisphere, which makes many of the species quite harmful pests. This research required locating ‘type specimens’ or original individuals that were used to describe the species in museums, borrowing them and preparing them for studies while avoiding inflicting any damage, so that they can be used by future researchers. These special specimens are the “standard bearer” for the scientific name and solidify the morphological as well as the molecular identity of a species. Furthermore, Dr. Solis explained that it is not only important to be able to recognize if a species is new to science, as she and her colleagues recently discovered with a species feeding on Eastern gamagrass in the United States. It is also crucial for tying a species’ scientific name to its biology or genetic composition. The biology of many moth species is still a mystery, but a recent study, where Dr. Solis participated, identified and studied the biology of some of the species. It showed that there may have been two introductions of the sugarcane borer moth species to southeastern United States and it is likely that there is a species which is currently ‘hidden’ under the same name. She concluded that there is still much left to discover about these moth species from the Western Hemisphere. Solis, M. A. & M. Metz. 2015. An illustrated guide to the identification of the known species of Diatraea Guilding (Lepidoptera: Crambidae: Crambinae) based on genitalia. Zookeys. 565:73-121. doi: 10.3897/zookeys.565.6797.